Cynthia moved to The Bay Area in 2013 after being tired of all the sunny weather Los Angeles had to offer. 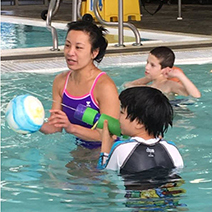 With a love for water, she was attracted to KEENQuatics and quickly took on the volunteer coordinator role. This is her 4th season with KEEN! Cynthia currently works in the wine business and has held various roles in the retail industry since graduating college. You can find her in the East Bay scouting out the best reasons why it is better than The City (San Francisco). Weather. Food. Parking. Enough said.